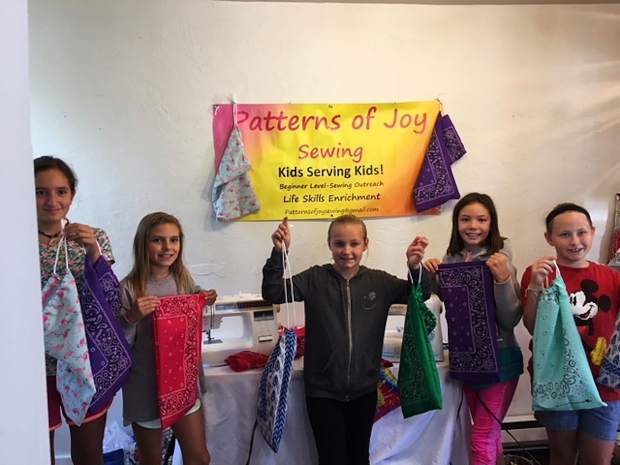 Twelve kids in Eagle Valley community sewed 46 bandana welcome totes with great heart to serve kids and their families, who attend Round Up River Family Camps. Patterns of Joy Sewing Outreach, a local nonprofit, and ARTSPaCE Workshop +Gallery provided the fun opportunity for these local kids to support others, who are challenged by difficult medical matters. The welcome totes are filled with practical and fun items sponsored by community businesses and the support of Vail Valley Cares. We hope to see your kids at a community event with Sewing Outreach Project: Kids Serving Kids or feel free to contact Patterns of Joy to create an event. For more information, email Patternsofjoysewing@gmail.com.